It’s the least wonderful time of the year; with the last remaining cinders of holiday spirit dead and spring still nearly two months away, midwinter crushes the soul with long nights, brutal cold fronts, and the clutching bitterness of watching your favorite team being unceremoniously drummed out of the playoffs (WHY, Peyton Manning?!) — oh, sorry, I meant the perennial threat of influenza. Yes, it’s flu season once again. Fortunately, however, the 2012-2013 season does not appear to be one for the record books, but it was only four short years ago that the world was ravaged by the pandemic media coverage of the H1N1 “swine flu” virus, the symptoms of which included ominous taglines, the obsessive repetition of mortality rates, and gratuitous footage of pigs eating. To be sure, humanity has a rich history of such global crises. The Black Death which decimated Europe and Asia between the years of 1348 and 1350 cut the world’s population by as much as one third, while the far more recent Spanish flu pandemic of 1918 killed between 20 and 50 million people worldwide. Since then, of course, medical science has advanced by astronomical leaps and bounds (the authoritative account delivered to King Philip VI in 1348 by the esteemed Paris medical facility concluded that the source of the plague was “a major conjunction of three planets in Aquarius”). However, modernity has been a double-edged sword in many ways, for the same technological revolution which allowed for the mass production of vaccines also gave rise to prodigious transmission vectors via a high-volume global transportation network. 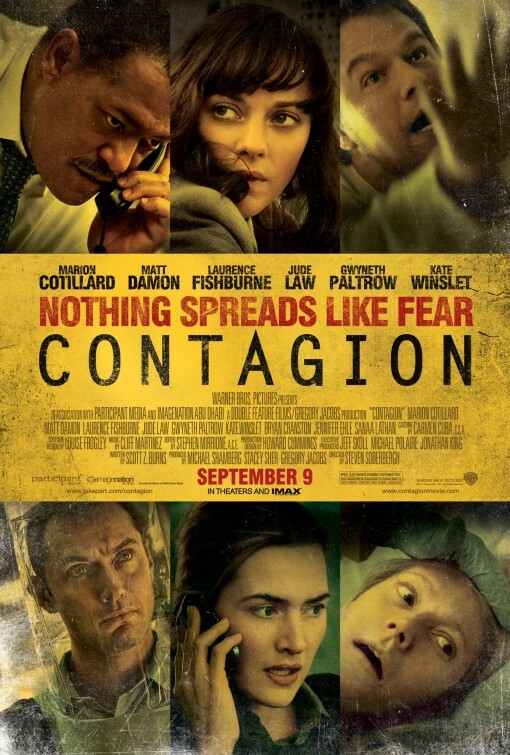 In Contagion,an infection which originates in Hong Kong takes less than 48 hours to spread to Tokyo, London, Chicago, and St. Paul. The colossal scope of 21st century transportation infrastructure has also lead to a far greater level of interdependence than would have been imaginable even in 1918. Due to unending convoys of food trucks, most major cities such as New York only have around two or three days worth of food at normal consumption levels at any given time, making the effective enforcement of a large-scale quarantine a logistical nightmare. Compared to most other treatments of a speculative global pandemic, however, Contagion offers a rather rosy picture of the disintegration of a disease-ridden society. In Orson Scott Card’s Hidden Empire, the United States military constructs a continent-wide quarantine about all of Africa to contain the spread of the horrific nictovirus, leading to untold war, starvation, and genocide in the sub-Saharan nations before the blockade ultimately fails and the infection spreads, and who could forget Will Smith’s desperate struggle against the hideous vampiric mutants who roam a planet left desolate by the Krippin virus in the 2007 film I am Legend? We can only hope that such catastrophes remain safely in the scripts of middle-tier sci-fi films.